10. Ask clients to remove their glasses. I secured my first major photo shoot — at Southfork Ranch, of all places — and learned all sorts of things about setting up soft boxes and staging a scene for portraits. All went well — my husband and daughter attended with me and assisted in taking candid photographs. However, when I got home I realized that the birthday girl’s glasses had some sort of coating on them that reflected the soft box lights GREEN! I stayed up past 2am editing out the alien eyes, and I learned to always, always, always check for glare on glasses, make adjustments to the lights, or suggest the client remove the glasses. 9. Call ahead when photographing college campuses. It was one of those eerily beautiful days. The normal smoggy slate-blue of our north Texas skies gave way to otherwordly gorgeous skies without a hint of pollution. The trees had reached their peak, and I wanted to get some punchy fall color against the backdrop of that sky. I’d read an article in the newspaper about Dallas Baptist University’s picturesque campus. So I loaded up my camera and set out on a photog field trip. I’m a newbie to this photography business. 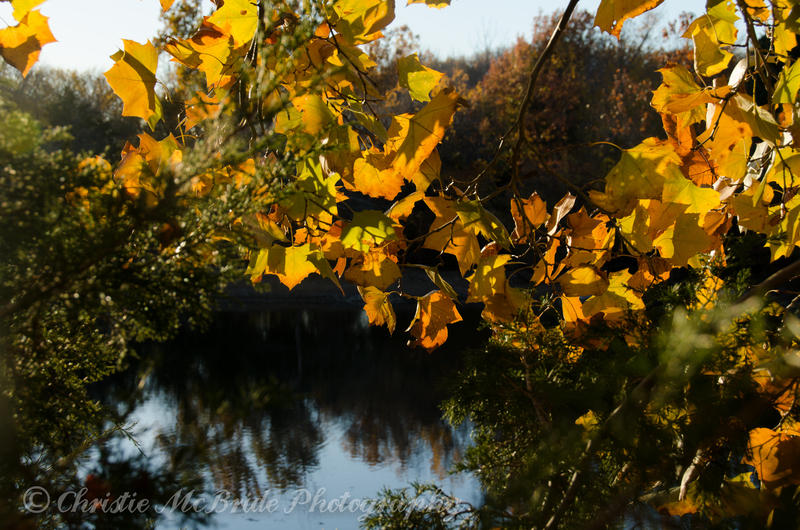 I didn’t realize I needed permission to take pictures of trees and ponds, but apparently I needed it. The security guard who politely kicked me off campus had an open Bible sitting on his dash board, so I didn’t get TOO mad at the situation. Instead I stopped by the pond near our house and took that shot as seen above. 8. Get an assistant when photographing large groups. And bring LOTS of chocolate. I did another gig where I took photos of homeschooling co-op classes. People were handing me order forms and checks right and left — but my mind was overly occupied with getting everyone in the frame, all eyes open, everyone in focus, good posture, smiles, etc. It would have been nice to have an assistant keep track of all those checks. At the end of the day, I thought my legs were going to fall off and lay down right there on the floor. Chocolate would probably have helped! 7. Don’t talk and cook bacon at the same time. When we had family in town for Thanksgiving, I burned an entire package of bacon because I was too busy talking and not paying enough attention to the bacon cooking in the microwave. I like crispy bacon, but brown…not blackened. After avoiding soy for six months or so, I ate some meat that had been marinated in soy…and lived…barely. 5. Gluten is Good for Me. After the soy episode (see #6 above), I thought I’d revisit whether or not going gluten free would be a help to my ongoing problems with food sensitivities. So I cut out wheat and gluten for the 5th time….and again nearly died with severe stomach pain a little over 24 hours later. (I didn’t actually nearly die. I just felt like I wanted to.) The last time I went gluten free and this happened I thought it must have been something I was replacing the wheat with — like corn, or potato flour, or rice. This time I just went completely grain free. I’m the only person I know who feels WORSE when going gluten-free. Even google searches don’t bring up any references to this strange phenomenon. So I’ve learned that for some reason, my body needs gluten. Pass the pita bread, please. 4. Typing is hazardous to my health. As I write out this blog I am becoming aware that I can’t do this much longer. I have weird sensations in the fingers of my right hand that are worsened whenever I use them. They feel like someone else’s fingers have been grafted onto my hand. I also can’t lean over and support my weight without my wrists and elbows giving out and nerve synapses firing a frantic PAIN message…ditto for lifting a cast iron skillet, gallon of milk, etc. An internet WebMD search tells me my numb fingers are likely the cause of carpal tunnel, Raynaud’s, Lupus, MS, rheumatoid arthritis, or scleraderma. Since I already have a diagnosis of Raynaud’s, I’m going to go with that. Maybe I’ll use a speech to text program or something to help me write. Thank goodness, for those heavy-liftng jobs I have two built-in alternate sets of hands and wrists and elbows in the form of my hunky husband and teenage daughter! 3. Young Living’s Thieves and Purification…WORK! 2. Dropping a plastic remote control on a wood floor triggers the glass break sensor of a house alarm. In case you were wondering. Take my word for it. I don’t recommend trying it at 2am. 1. Bella’s hair goes with everything. The glossy fur of my yellow lab literally goes everywhere…in my hair, on my clothes, on the couch, in my socks, in my car. If I collected every hair in her crate, in the washing machine, in the vacuum cleaner, under the couch, in the dryer, and stuck in my foot like a needle (ouch! ), AND if I knew how to knit, I could make a lab-fur coat. I think I’m on to a business idea here! 0.5 I can’t count…but I do know that God is Lord of all, even zeros and ones! My external drive was connected to my laptop computer when the power supply died. (i.e, I waited too long before charging). After I plugged the computer back in, it would not “see” the external drive. So I switched over to a different computer…and it still wouldn’t be “seen.” Photographs from the past five years are on that drive. I’m still awed to report that after some earnest, teary, heart-felt prayer, I tried plugging it in one more time. It worked! And…that’s a wrap. My reflections are now yours. Enjoy!